The other day, in another part of the world, there was an actual military coup. Going in with machine guns blazing, the military removed the "democratically elected" president and his cabinet members. The president is imprisoned somewhere where the military assured the world they are attending to his health and security needs. They also captured and are holding the general in charge of the joint chiefs of staff who was supporting the president. At least three soldiers were killed in the battle. The military in this case freely admit that this was a military coup. 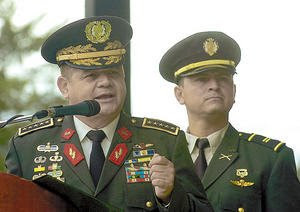 Two of the three top leaders were involved in the last military coup in 1999. They have installed a prime minister who they freely admit is under their complete control. The leaders of the coup suspended the country's constitution and immediately dissolved all democratic state institutions. The country was put under 24-hour curfew and all borders were closed. The military leaders have said that they had to do it to save democracy in their country and that they will be rewriting the constitution and will hold (military-run) elections soon, perhaps in a year. In contrast to the swift and harsh condemnations received by Honduras, only the African Union and France, who has a $1.5 billion uranium contract under the deposed government, have condemned the Niger coup. The US government has been practically mum on the issue, willing to take the coupsters at their word that they are the good guys. Aaron at Pensieve, in US Hypocrisy: Niger and Honduras, covered part of a US State Department daily briefing in which the US reaction basically appears to be a big yawn. This short press briefing from the US Deputy Assistant Secretary for African Affairs William Fitzgerald so reeks of US hypocrisy in comparison to Honduras that I am literally speechless. The US often arrogantly stated that conditions in Honduras − which had a fully functional civilian government, led by a civilian president who assumed office under the constitutional order of succession − were "not right" for holding the already scheduled elections. 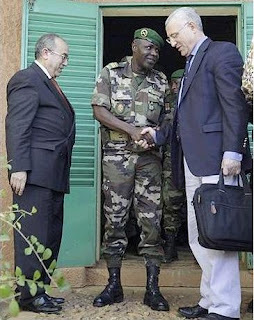 The US is now perfectly content to allow a violent military junta to hold elections in Niger, while the democratically elected president remains prisoner. Ho-hum. So what? "So far, the new government seems to be saying the right things. They call themselves the Supreme Council for the Restoration of Democracy. And if anything, today, we would encourage them to move as quickly as possible if they are serious, and we hold them to that, to restore, in fact, the democracy that existed before Mamadou Tandja himself had begun to modify the constitution and extend his rule extrajudicially. So at this point, what we’re doing is – the ball is in their court." Deputy Fitzgerald was particularly encouraged that the military regime called themselves the Council for the Restoration of Democracy. If they say so, it must be true. Another briefing from the US Assistant Secretary of African Affairs Johnnie Carson is excerpted below. No doubt the question of the hypocritical US position on coups had to come up in private State Department discussions before these press briefings occurred. My guess: They said "Americans don't give a damn about Honduras or Niger. Let's just go with it." 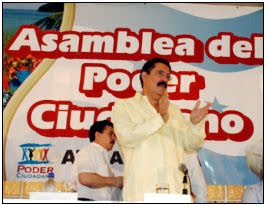 A couple of months after signing Chávez's ALBA treaty (in August 2008), Zelaya began talking about a referendum to consult the people about rewriting the constitution. Initially, like most people, it sounded fine to me. I wrote long ago that I have no problem if the Honduran people decide to allow someone to run for president for a second term. What would be scary is if that president can somehow declare himself an extended term and that didn't seem so farfetched anymore. Zelaya, however, was well-known for coming up with big plans that were not well thought out, cost lots of money, but then never materialized, like the time he said he would build an international airport in six weeks. In the months before June 28, we began watching more and more of the state-run television station. We saw that Zelaya never gave any straight answers about what he hoped to change in the constitution − never − except to make vague comments about making it 'more democratic' or that it was "too old" (27 years). The ironic thing was that the people attending these Poder Ciudadano (Citizen Power) meetings were never allowed to ask questions. Their role was only to sit and respectfully listen to the hour-long diatribes of the man who claimed that citizens should be consulted. 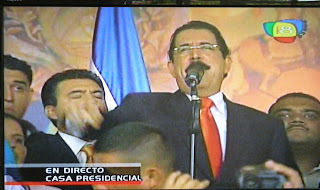 Zelaya gave very divisive speeches, pitting one group against another. During his term, he was always at odds with the congress, the courts, the teachers, and the media about something. He completely alienated the majority of the media while paying off other, less scrupulous media for favorable coverage. We saw him and his staff be evasive about providing details, including financial details of how much money was being spent on publicity and public meetings all over the country and where the Petrocaribe funds were going. No information was provided about how the members of the constituyente (constitutional assembly) would be selected or whether the people ultimately would have the ability to approve or disapprove the new draft constitution. It seemed as if this referendum was just to 'write a blank check' to Zelaya, who would presumably be in charge of the assembly. That only added to my worries that this constitutional assembly did not bode well for Honduras. Early in June and again the week before the planned June 28 referendum, we saw massive public marches against the cuarta urna (fourth ballot box), not the dozens or hundreds that we had seen in other protests, but tens of thousands of protesters. This photo is from a later demonstration but will give you an idea of what was taking place. Demonstrations are a way of life here in Honduras, but that was the first time I had seen huge demonstrations in Honduras that weren't organized by the unions. "No to the cuarta urna, yes to democracy" was the theme. I saw a massive march of people dressed in white on (I believe it was) June 24. The reporter interviewed a woman, María Marta Díaz. I did not know who she was but I will never forget this. She spoke directly to the camera (I'm paraphrasing from memory): "Look at us! (gesturing to the tens of thousands of people behind her) We are are behind you! DO THE RIGHT THING for Honduras!" She was visibly shaking, as was her voice. It gave me chills. I felt my hair standing on end. I wasn't even sure who she was talking to, but I assumed it was either the military asking them not to allow Zelaya to violate the constitution or to the congress asking them to stop Zelaya before it was too late. I still get shivers thinking about this. That woman is burned into my mind. I found out later that it was a group of women who started the whole movement to stop the cuarta urna. They didn't want their children growing up in a Cuba- or Venezuelan-like society and they were determined to force their government to protect democracy in Honduras. I also only realized later that Honduras was headed to a 'disruption of democracy' or 'coup d'etat' no matter what. The military were the key. 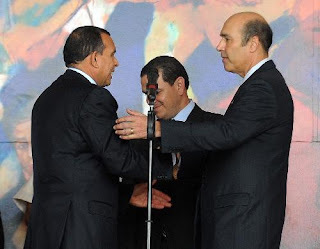 Had they decided to support Zelaya, we would have had a "coup d'etat" of a different sort. The OAS was supporting Zelaya, despite many comments from other countries, including the USA, in the June 26 emergency OAS meeting voicing their concern about Zelaya's undemocratic actions and his lack of respect for the separation of powers. All of those countries seemed to have forgotten about that after June 28. The following article was drafted back in early July 2009 and added to at other times when I thought I might post it. I guess that other things came up that seemed more urgent at the time and I never published it. The article has grown and grown, so now I will post it in parts. Maybe it will be of interest to those of you who were fooled by the bravado. Many people think that a "coup" occurred in Honduras on June 28, 2009, out of the blue. The truth is that Mel Zelaya's actions and disregard for the constitution and the laws made some sort action against him inevitable. The separation of powers of a democratic government is designed to prevent megalomaniacs like Zelaya from taking control of a country. 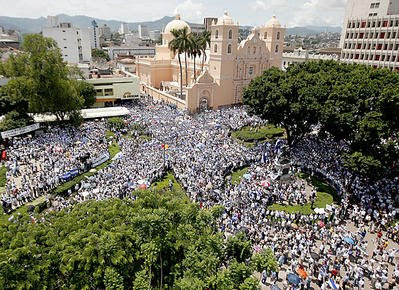 The June 28 action, which was to prevent an auto-coup by Zelaya, may have been sloppy by world standards, but it worked. Democracy was preserved in Honduras, despite the best efforts by the US, OAS, and Hugo Chávez to intervene. For more than year prior to June 28, 2009, in Honduras, there had been so many rumors of coups d'etat (or golpes de estado as they are called in Spanish) that I couldn't even count them. Most of the time, the reports were vague, saying things like "There are forces trying to destabilize the democratic institutions of the country." Those claims would come from Congress, from the President, from political analysts, from former presidents, from everywhere, it seemed, inluding from Venezuelan President Hugo Chávez. There were suggestions that an auto-coup was planned, in which Zelaya, with the assistance of the military, would take control and dissolve the other branches of government. Now, after learning more about recent history in Venezuela and Ecuador, I now have no doubt that is exactly what Zelaya had planned with his constitutional assembly. One way or another, his goal was to stay in power, either as president or president of the constitutional assembly which would run the country. Zelaya's long blatant history of violating the constitution and the laws of Honduras began within weeks of his assuming office. I will write more about that in another article. My feelings about these reports would fluctuate between "someone is just trying to make someone else look bad" to feeling, frankly, really a little afraid about the whole situation. I am a born and raised US American. What did I know about coups?! When the subject of Honduras joining Chávez's ALBA alliance came up last year, that worried me. It also worried me that the treaty itself was not even made available to the media or even the congress until a week after it was signed by Zelaya. No one knew what Zelaya had agreed to. Though everyone said that the congress would never ratify the treaty, in the surprise of all surprises, they did, accompanied by reports of secret meetings and L.1 million payments (US $53,000) to some congressmen. Venezuelan President Hugo Chávez, along with other ALBA presidents came to Honduras for the ALBA signing ceremony (please read the comments, too). Business leaders boycotted the ceremony and many of the citizen attendees complained to the media later that they hadn't received their promised payment for attendance. In his usual manner, Chávez insulted the US, the highly respected Catholic Cardinal Rodriguez of Honduras, and most of all, the Honduran people in his speech. Chávez said that anyone who was against ALBA was ignorant or a vende patria (someone who would sell out their homeland). I believe he made some comment about Hondurans being US bootlickers or something similar. Big mistake in a country where 80% of the population is Catholic and many people value pride and dignity over eating! Around that same time (August 2008), US Ambassador Charles Ford returned to the US and new Ambassador Hugo Llorens was sent to Honduras. Zelaya refused to accept Llorens' diplomatic credentials and made some rude public comments about the United States, saying he didn't need the Imperalist's permission to sign a treaty, among other things. This was so embarrassing to the Honduran people who had always thought of the US as a friend and ally, not to mention Honduras' largest trading partner and home to many Honduran immigrants. Zelaya accepted the credentials a week or two later and tried to claim that his previous action was just normal and no big deal. Being a born worrier, I began wondering if Zelaya would also follow Chávez's lead and begin kicking US Americans out of the country, too. I had written several not-so-flattering articles about Zelaya's crazy actions in the past. I began to receive warnings from Hondurans that I should be careful. But being a fearless blogger, I wasn't going to let that stop me from writing about what was happening. Please visit again for the next part of the story. Is it true? 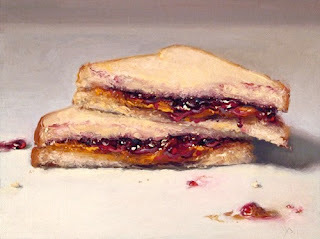 Have US Americans now become so rushed that they don't even have time to make their own peanut butter and jelly sandwiches anymore? 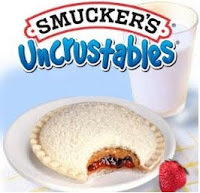 I was reading Fausta's Blog (a great source for Latin American news) when a flashing advertisement went by for Smuckers Uncrustables. I never, never ever, never ever ever click ads, but I was so intrigued that I clicked this one. Sure enough. Moms can now buy pre-made, pre-trimmed, frozen peanut butter and jelly sandwiches in several flavors. "Uncrustables® are the perfect 'grab-and-go' sandwich for families on the move." Just grab them out of the freezer and toss 'em to the kids on your way to work. Hey, I'm all for conveniences. You won't find me washing my clothes on a rock in the river (please read - it's funny) and I'm super happy that I don't have to collect wood for the fire or carry water from the creek in order to cook dinner as many women do in Honduras. But really! How much time does it take to make a P&J sandwich and cut off the crust? Or for God's sake, teach your kids how to do it. It'll be good for them. Related article: In my search for a picture of an Uncrustable, I ran across the hilarious "Uncrustables Experiment". Check it out for a laugh. The descriptions are priceless. A reader wrote to say that he wasn't receiving his subscription to the Blogicito. I checked on the Feedburner list and discovered that no less than 89(!) people have signed up for email subscriptions who never took that second step to confirm that they did in fact subscribe. As a result, they are not receiving the Blogicito in their email inbox. If you recently subscribed but haven't been receiving the daily (or less frequently) Blogicito email, please look for the verification email and click the link to finalize the subscription. If you have lost the verification email, please let me know. I'll have to remove your email address from the list so that you can resubscribe. Sorry! Don't forget to confirm when you receive the email! If you are a Twitterer or Facebook afficionado, I generally post a note when I've posted a new Blogicito article. 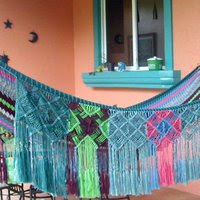 I'm 'La Gringa' on Facebook (recognize me by the colorful hammock avatar) and LaGringaLaCeiba on Twitter. If you prefer using a RSS feedreader, the subscribe links are in the upper right-hand sidebar. Thanks for being a Blogicito reader! The weather has been rainy again and our old reliable worker Carlos needed indoor work so we have been filling his days with this awful job. For the background on what happened, please see The day my floor exploded. Bad news gets worse: It turns out that at least 75% of the ceramic in this large room is loose to one extent or another. Tip: Here's how you can tell if the ceramic is loose. Drag the head of a hammer or other heavy metal object across and around each tile. You'll hear a tinny, sort of metallic sound from the secure tiles and a distinctively different, louder, hollow sound from the loose tiles. In a twist of cultures (or perhaps it's a male-female thing), El Jefe was set on removing all the loose tiles and repairing it properly. Me, knowing what we were in for since we've been through this before, said, "Just kill me first" as I picked up a screwdriver and made a motion of sticking it through my heart. Sawing also means that concrete dust will seep into every corner of our house, into every nook and cranny, coating every dish, every spoon, every book, everything. We will clean and clean and still be breathing concrete dust for weeks. So, with a sad face and a few tears, not to mention the threats of suicide, I convinced him to just do the immediate repair and if the others get worse, repair them later. The tiles will, of course, get worse, and I will, of course, later hear, "I told you so", but always put off to mañana what you don't want to do today, I say. In case you didn't read the original article, the reason the concrete has to be chipped away is so that when we replace the tile, it will be level with the rest of the floor. 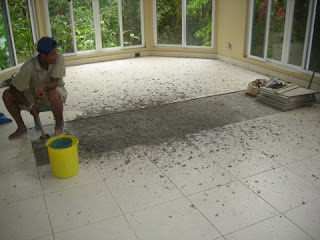 Thanks to a reader, we got the idea of wetting the concrete before chipping it out. That makes a huge difference in the amount of dust. Thank you, Reynaldo! We still have two tiles in which we'll have to use the saw to cut the grout and for that Reynaldo recommended placing a wet sponge nearby to absorb the dust before it has a chance to take wings. Isn't it great having expert readers? Update: This is a little project that I started a while ago. Since then we've developed a much better system and have a whole website devoted to Honduras Bloggers. Please see my article, Honduras Blogs, and please check out the Honduras Blogs site if you are interested in finding more Honduran bloggers. I've been happy to see so many new Honduran blogs started during the past year. I've discovered some just recently that I wish I had known about during the past months as I would have shared them with readers. It's too bad that the Red Catracha blog network is no longer active. Honduran bloggers need a directory! Some of my favorite Honduran blogs and other favorites are featured in the sidebar under "New stuff to read". Just click the blog name or article title to visit those blogs. In my links page, I also list my recommended Honduran and other Central American and Mexican expatriate blogs, as well as other Honduran-related links. I'm afraid that I've been lax about keeping that updated. If you are Honduran or an expatriate living in Honduras, or even if you aren't in Honduras but you blog primarily about Honduras, please use the Mr. Linky widget below to post a link to your personal blog. It's easy to participate. All you need to do is fill out two boxes: your name or your blog name and the URL of your site. If your blog name isn't self-explanatory, it would be helpful if instead of just a name, you also put your location or blog focus (for example, 'La Gringa - La Ceiba expat' or 'José - political views' or 'Missionary in Santa Barbara'). What do you write about? Please also leave a comment telling us a little more about your blog focus to entice readers to come for a virtual visit. And if you are a reader, share the love! Tell us which are your favorite Honduran blogs. PS: If you leave a link or comment just so you can include a link to a hate-filled political propaganda site, I'll look for links to the Blogicito or other opposing viewpoint sites on your blog, or else, as Carol says, the garden fairies will find your link and compost it! 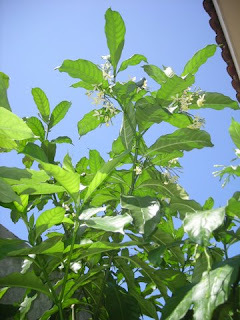 I finally remembered to participate in the Garden Bloggers' Bloom Day again! 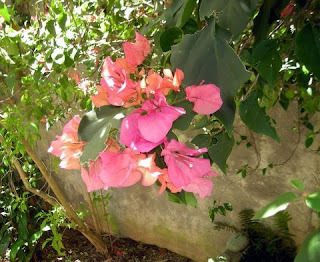 These are some of the flowers blooming in my La Ceiba, Honduras, garden today. I imagine this is a bit different than the snow-covered US right now. 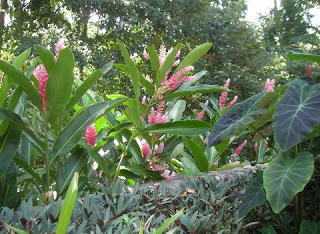 Alpina purpurata, the pink ginger, blooms without pause 365 days per year. It smells good, too. Bougainvillea, called Napoleon here in La Ceiba. 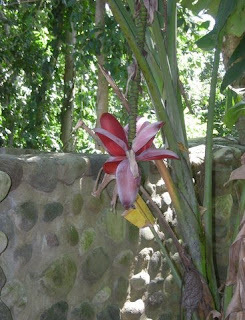 It is a staple of most tropical gardens as it is such a spectacular bloomer. I need help identifying this blooming tree. It was a volunteer and came up in the narrow side yard between the concrete muro (fence) and the house. I'm afraid we'll have to remove it because of the location − which just shows how things can get out of control during the rainy season, not to mention 7 months of political distraction. 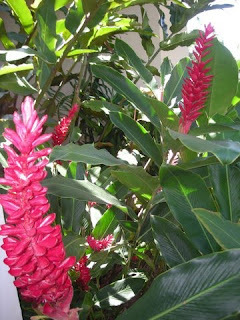 Alpinia purpurata, common name red ginger, grows to about 10 feet (3 m.) and blooms year round. It's a common plant, but there is none more dependable. 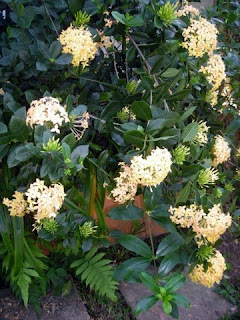 Ixora is a very common shrub in La Ceiba, but this pale yellow is less common than the neon bright colors. 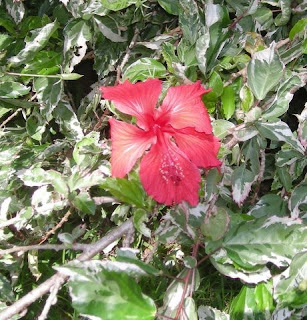 This variegated Hibiscus rosa-sinensis is quite large, at least 10 feet tall. I don't know the name of the variety. It may be Snowflake or Snow Queen. 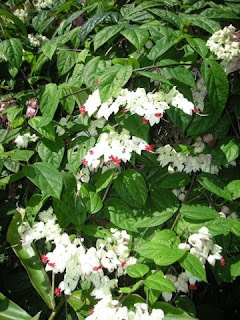 Clerodendrum thomsonae (Bleeding heart vine) is looking particularly good. The zompopos (leaf cutter ants) which devastate the vine every few months by eliminating every single leaf on the plant must be on vacation. Etlingera elatior, common name Torch Ginger. 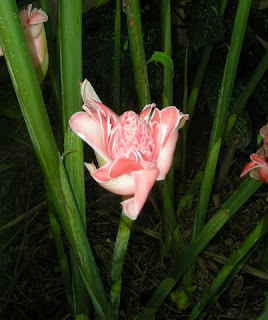 Here in Honduras, the pink Etlinger is called Bastón de la Reina (cane of the queen). 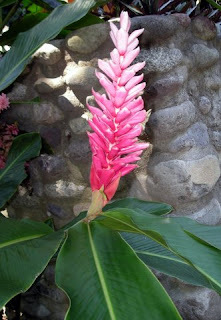 They are of the Zingiberaceae (ginger) family and the flowers rise from the ground on their own stalks. These blooms are a favorite of hummingbirds. These plants get HUGE! Some of the flowers are at eye level for me (about 5' tall) and the plants themselves are at least 15' tall. 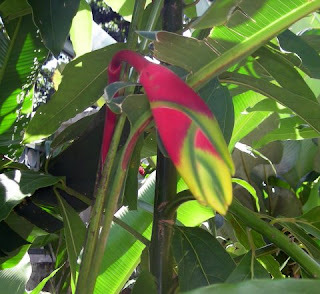 Heliconia rostrata (Parrot's beak) is a huge plant that spreads like crazy. In June 2008, I mentioned that we were going to have to be a little more stern with this plant. Well, El Jefe got very stern with it − he macheted every bit of down to the ground last year. It has come back and is just now starting to bloom again. I'm going to have to hide the machete. The blooms get much larger than this. Lemons! 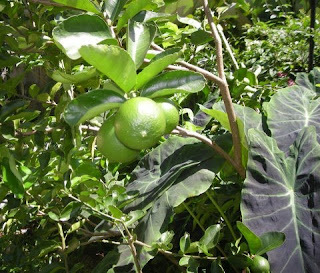 Or limes! Who knows! Manuel Zelaya stayed quiet for a week, but that was as long as he could stand it. In a press conference in Santo Domingo last week, widely covered by the Dominican Republic press but not so much elsewhere, Zelaya (yesterday's news) not only proposed that Honduras' constitution should be changed, but all other regional and subregional organizations' constitutions should, too. It took longer than I expected for Zelaya to get back into the groove. I believe that he must have made a solemn promise to someone to not make political speeches or preach against Honduras, in exchange for being allowed to leave the country (again) instead of being charged with crimes. Wash, rinse, repeat. Now that 'someone' knows that Zelaya's word means nothing, no matter who he gives it to. Zelaya has been quiet since that one press conference. freezing of bank accounts of "coupsters"
That last proposal is incredible considering the number of complaints filed (English) during Zelaya's administration, including murders, intimidation, assault, and refusal to provide information. One of his top cohorts, Marcelo Chimirri (who is now in jail awaiting trial for unrelated corruption charges), brought a US $25 million defamation lawsuit against two Honduran newspapers for merely republishing an article from a Mexican newspaper. Seven other journalists were sued (English) individually for criminal defamation by Chimirri. 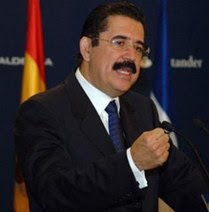 In the past, Zelaya proposed a law censoring crime news, forced all radio and television stations to broadcast his nightly two hour cadenas (English), refused to provide information about finances, use of aid funds, projects, treaties, and even swine flu statistics, paid millions for favorable media coverage, and he constantly complained (English) that the media was against him. But wait! There's more. Zelaya also proposed sanctions against the governments who recognized the de facto government. Ex-president Zelaya said that he will return to Honduras 'pronto' but added that "there are no conditions for justice in Honduras. What I propose is a process of reconciliation and restoration of democratic order in the country, since the effects of the coup are still present in Honduras." Zelaya also demands immediate cessation of the "repression" that the Honduran pueblo is still suffering (under Pepe Lobo). He suggest a Great National Debate to Restore Democracy..... as if he didn't know that Lobo's platform was based on a Grand National Dialogue. He assured the media that he achieved the best economic indicators in the last 30 years, with growth superior to the average of Latin America and a 10% reduction in poverty after stagnation for 30 years -- claims that have been found ridiculous by organizations who track such things, like FOSDEH, who report that poverty actually increased during Zelaya's term and the increase in economic indicators was a result of family remesas sent by Honduran workers in other countries. "The Spy" column in one newspaper said that he swept into the press conference like a movie star, sans cowboy hat, and greeted almost all of the journalists with a kiss. 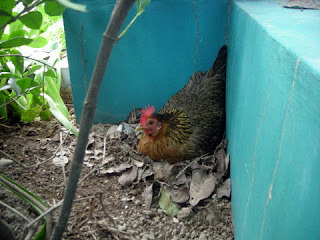 This hen is feeling the nesting instinct. The evil giant featherless monster (me) has been daily removing her eggs and the eggs that her friends kindly lay for her, much to her frustration. To show how strong that instinct is, the poor desperate girl is now sitting on a couple of rocks hoping for the best! I know those rocks were not there the day before this photo was taken. 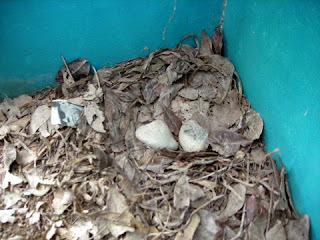 After removing the hen and eggs, I was admiring the little nest of leaves and it definitely was empty. Today − wallah! 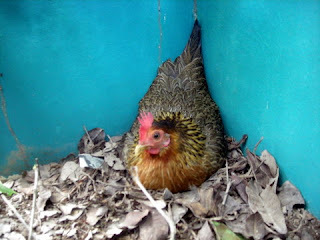 − the hen has laid two rocks and is keeping them warm and cozy. One of the reasons that we all have eggs year around and they don't cost $1 per egg is that over the years, breeders have bred the nesting instinct out of most chickens. 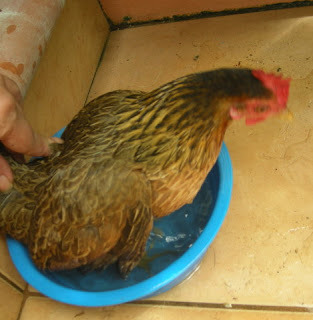 Hens naturally lay less when they are molting, in very cold or very hot weather, or when daylight hours decrease, and not all when they become broody or for several weeks afterward. Unnatural conditions of egg factories and breeding out certain characteristics solve most of those problems. My hens, being more closely related to the original red jungle fowl, have other ideas, though. Bantam hens are the absolute worst at going broody − always wanting to sit on eggs (for three weeks) to hatch them rather than laying eggs. So my hens, rather than becoming egg making machines, have taken it upon themselves to try to increase the chicken population of the world....or at least of La Ceiba. When we first got chickens, I had visions of magnanimously giving out farm-fresh organic eggs to friends and family. Nothing could be further from the truth. Despite feeding 18 chickens, we are still buying eggs! To be fair, right now most of the chickens haven't reached the egg laying stage so we should see some improvement. But invariably, we have had one, two, or three hens (of four or five) in the broody stage and the others laying their eggs in precarious spots where the dogs can find them. This hen has decided that it's time to increase the species again and I've been trying to disabuse her of that desire by removing her from the nest. I make half-hearted attempts to try to break their broodiness − like by dunking her in a bowl of cool water − but I don't like to upset them too much, so I usually give up and let them have their way. Update: a week after I first wrote this, the hen is still sitting on the rocks. What, you say? You've been doing all this reading about Honduras and didn't know that Honduras had a Prime Minister? Even worse, you are Honduran and didn't know that you had a prime minister? Who Dat? Dat's who! Don't feel too bad. 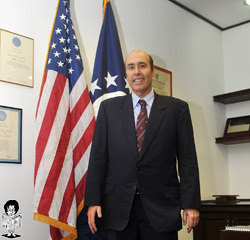 Honduras did not have a prime minister, that is, until US Ambassador Hugo Llorens unofficially assumed that position. President Pepe Lobo met with Llorens to get his marching orders in the morning of his first full day in office. Government officials meet to decide the formula for setting gas prices, and there is Hugo Llorens to make sure they do it right. The Truth Commission is discussed, and there is Hugo Llorens to make sure that everyone understands what 'truth' is required by the USA. The Congress meets, and there is Hugo Llorens to tell them what they need to get done. 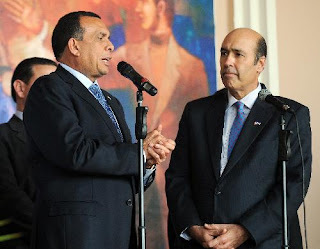 Llorens has met with the two most powerful mayors in Honduras and held out the carrot (aid). He gives us his conditional blessing: He sees that Honduras is headed in the right direction, but in the judgment of the Imperialist, there is much kowtowing to do in order to return to the fold of the international community. "We'll be working jointly," he says. The President meets with his cabinet, and the photo op shows that there is Hugo Llorens, sitting at the table as if he was a member of the Honduran government! Afterward, at the President's press conference, he is side by side with Hugo Llorens who patronizingly pats him on the back. 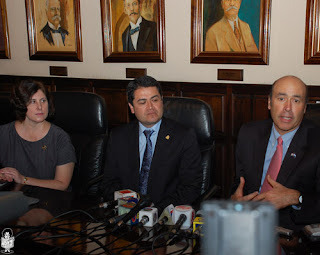 I've seen more of Hugo Llorens face on the news than the new Honduran president in the past two weeks. He never fails to sound condescending in his press conferences as he discusses what "Honduras needs to do". The naughty little colony is being brought back into line after its 'time out'. I read on an Embassy employee's blog that when Hugo Llorens and the Washington delegation arrived to the inauguration, there inexplicably was no place for them to sit. Heheheh! Do you think that was poor planning or an oversight? No way. Someone scrambled around and found some folding chairs for them. Next time, don't wait so long to RSVP. Just days before the inauguration, Llorens reported that he didn't know who would be representing the US. Show a little respect. Despite the dangling carrots, Hondurans recognize a false friend. Ambassador Llorens was booed at the inauguration and he has been consistently found to be untrustworthy in polls. 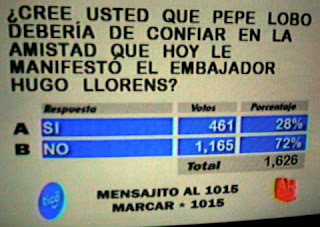 This January 31, 2010, poll asks: Do you believe that Pepe Lobo should trust in the friendship shown today by Ambassador Hugo Llorens? Yes, 28%; No 72%. In a really interesting interview with former Minister of Foreign Relations, Carlos López Contreras, he states: "The behavior of the United States both before and after the crisis is openly hostile to our Government....denying oxygen at all times to the government that emerged from the contra-coup because we must not forget here that who intend to give a coup was Zelaya and his supporters, who violated our political and constitutional laws and intended to subvert the democratic system and stay in power indefinitely." López Contreres also mentions the lack of allies, those who said, (paraphrased by LG), "We're with you, man, but we can't come out of the closet. Sigan adelante! (Go ahead), but don't count on us." He says that they were told to resist the pressure, but "we can't support you publicly". I highly recommend that you read the El Heraldo interview (in Spanish). Unfortunately, the Google translation to English leaves out a lot of 'nos' and 'nots' rendering it useless. Meanwhile, ambassadors return to Honduras with great fanfare to tell us what a friend of Honduras they are while they express pleasure at the "return to democracy" of Honduras. The Honduran National Congress approved the amnesty decree, as demanded by the United States of America, on the morning of Pepe Lobo's inauguration. The decree covers acts committed from January 1, 2008 until January 27, 2010. A copy of the explanation of motives and final decree (in Spanish) was provided to me by a Honduran congressman. A Google translation of that document to English is here. It is far from a perfect translation but should give you an idea of the background and the decree. Specifically excluded from amnesty are all actions which constitute crimes related to corruption, misappropriation of public funds, illegal enrichment and other crimes against humanity (which relates to the alleged human rights violations). Though news reports implied that all acts of treason, sedition, abuse of authority, violation of duties, usurpation of functions were granted amnesty, the decree specifies only certain paragraphs under each of these categories of the penal code. A copy of the Honduran penal code can be found here (in Spanish). "335.6 Those who integrate armed groups who invade or assault the population, farms, roads, hospitals, banks, commercial centers, work centers, churches, or other similar places, causing death, fires, or property damage, or exercise violence over persons....."
"335.7 Those who provoke property damage using bombs, explosives, chemical substances, flammables, or similar." "335.8 Those who, through threats or violence or by simulating public authority or false orders of the same, ..... obligate another to submit, send, deposit, or put at his disposition property, money, or documents capable of producing judicial effects. Likewise, those who by these same means obligate another person to sign or destroy documents in his possession." Attorneys have opined that victims of terrorism could file civil suits against the government of Honduras for restitution. The government has already been stuck with the bill for millions for repairing several electrical towers which were sabotaged. Can you understand my dismay (to put it mildly) that the USA − while it continues its own unforgiving war on terrorism − forced this amnesty business on Honduras? Expressing political differences is one thing; burning buses, cars, and restaurants, throwing bombs and grenades at radio stations and newspapers, and endangering lives and property of innocent people is something else. The Nacionalista party (Lobo's party) holds the majority of the congressional seats, 71 of 128. Though it was reported that the Nacionalistas voted in block, one congressman said that he and another Nacionalista voted against amnesty. There are no statistics, but many say that the majority of Nacionalista party members are against amnesty and feel betrayed by the congressional approval. The Liberal party (Zelaya and Micheletti's party) congressmen abstained from voting because the public wasn't consulted and they felt that the facts should be known to the Truth Commission before granting amnesty, but El Tiempo reports that five Liberal congressmen were against amnesty and three were in favor. Four PINU congressmen abstained as well, logically saying that the Truth Commission should be installed and the congress should know who was being pardoned and for what acts. Two DC congressmen voted in favor. Four UD (formerly pro-Zelaya and pro-Resistance) voted against amnesty. "Corruptos need to go to jail, period," said Lobo during his inauguration speech, to wild cheering of the audience. What is the point of a Truth Commission if the verdict − amnesty − has already been given? Hondurans hope that the Truth Commission will not be a farce and will not only explain the facts leading up to June 28, but will also expose the errors of the USA and OAS (Organization of American States) involvement. But, since it appears that the USA and OAS will be in charge of the Truth Commission (though they deny it) and will be working very hard to cover up their part in worsening the situation, there isn't much chance of that happening. The Unión Cívica Democrática (UCD), which represents a large portion of civil society, has strongly objected to the OAS taking any part in the Truth Commission on the grounds that they are not impartial. Here is UCD's original open letter in Spanish. A translation to English is here. Victor Rico was sent to Honduras by the OAS a couple of days ago. He gave a press conference yesterday to clarify that the OAS was only here to help. The tone of his press conference was a little defensive. It was clear that he had gotten an earful from someone. The following is a guest blog by Jorge Gallardo Rius. The US Foreign Relations Committee report to which he refers, "Multilateralism in the Americas, Let's start by fixing the OAS", can be found here. The new President of Honduras has shown that he is willing to go a long way to please the Governments of the International Community, but the current demands by the Secretary General of the OAS that they take part in conforming the Truth Commission are downright obscene. Not only has the OAS not been an impartial observer in the crisis, but more than that, the OAS has been a key player in the Honduran crisis. That the OAS played an active role in the Honduran Crisis is most notorious in the airport incident. Members of the OAS, including its Secretary General, rallied out of a meeting in which they hastily condemned Honduras, boarded two Venezuelan jets, violated Honduran airspace and attempted a forcible landing in the Honduran capital, with Manuel Zelaya on board to forcibly restore him to power. Don’t forget that several members of the OAS warned them that they shouldn’t attempt this adventure. And let's not forget that a youth died in the events surrounding said adventure and that this case is still under investigation. The OAS’s punitive stance against Honduras, in which “Speed trumped deliberation” according to one Senior OAS official in a recent report to the US Senate Foreign Relations Committee, could become even more critical if the results of the Truth Commission showed that the Hondurans acted in defense of their democratic institutions, as they have repeatedly argued, against a rogue president attempting to destroy the peoples’ constitutional right to a free and democratic society. The Report to the US Senate Foreign Relations Committee points out that “Because military coups have been relatively rare since the democratic wave of the 1980s and 90s, the greatest danger to democracy lies with elected officials who abuse their constitutional powers.” Thus, the arguments that the Interim Government acted legally in defense of its Democracy are credible and would set a damper in the OAS’s management of the Honduran Crisis. 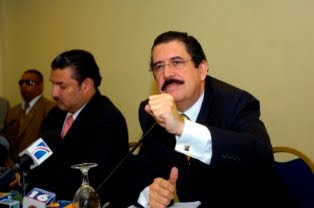 Yet, evidence shows that on June 17, the day after Zelaya lost his legal appeal to the Supreme Court, thus confirming that his actions were illegal, the OAS sent a special envoy to Honduras, Raul Arconada. And according to the Report to the US Senate, “the Permanent Council issued a resolution on June 26 calling on all actors to ‘‘avoid a disruption of the constitutional order’’ and directing a Special Commission to visit Honduras” AFTER the illegal action would have taken place. The content of the envoy’s reports and communications to the OAS have not been made public, but according to sources in Honduras, this envoy and that mission’s objective was to whitewash the illegal actions by Zelaya and give his actions an appearance of legality. If that is true, then the OAS wasn’t passive in the events that for so long have affected Honduras’ reputation and economy, but on the contrary, the OAS would have been actively supporting the erosion of Honduran democracy. Remember that many nations condemned Honduras because they followed suit to the OAS’s decision. Thus, the intention to obscure these facts may explain why the OAS hurried to condemn the events in Honduras, why they refused even to listen to a presentation of facts and evidence supporting Zelaya’s removal and why they are so anxious to be a part of the Truth Commission. In all countries, including the US (remember Kennedy’s assassination? ), Truth Commissions have always been formed with nationals, not foreigners, and there will always be people who don’t accept the conclusions, as there are still many conspiracy theories about Kennedy’s assassination. But the participation of organizations and individuals who have been a part of the problem must be avoided to maintain a small modicum of faith in the results. What truth can come of an organization with a vested interest in the outcome? "....in response to military overthrows in Venezuela in 2002 and Honduras in 2009. These crises revealed the shortcomings of the OAS's defense of democracy. In both cases, the OAS reacted forcefully to the democratic interruption, yet it had demonstrably failed to respond to the erosion of democratic institutions by elected presidents that preceded the coups."